update: I'm not not sure when things changed, but I am now seeing a RAID Setup Prompt on this machine when I boot OpenVMS-8.4 with patch-kit 1200. 99% of our source code (~ 200 programs: 90% VMS-BASIC; 10% DEC-C) is built from DCL scripts so I suspect we will only need to use DECnet to copy over the source code then generate a master script to invoke the individual build-scripts (when necessary) or just perform a vanilla compile-then-link. OpenVMS software licensing has simplified with each owner. With HP, licensed software under "an active support agreement" has a 100% trade-in value so is transferred to the new platform at no charge. Licensed software not under a current support agreement has a 40% trade-in value. In either case you must supply software authorization numbers. It was racked and powered-up by an HP field technician yesterday (June-18, 2015). This technician knew nothing about OpenVMS but told us that we could have ordered a machine with a preinstalled OS. We were also told that we could put in a request to have another HP technician install OpenVMS for a fee (we declined). Anyone coming from an Alpha background will be in for a shock because newer Itaniums do not have a traditional console. 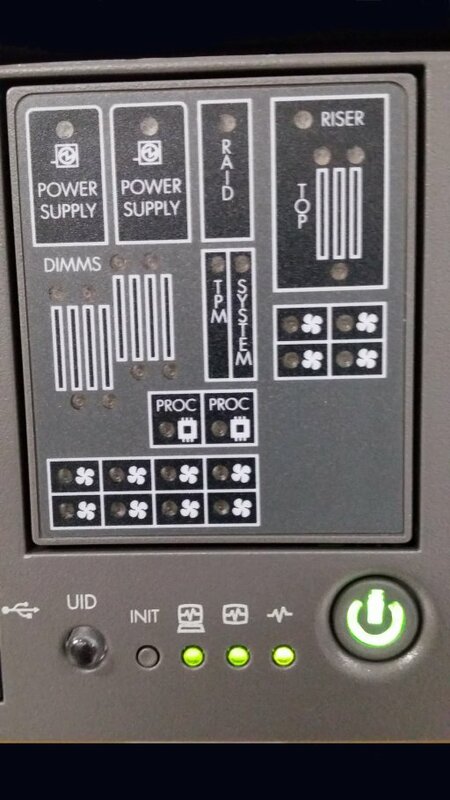 Almost everything is done via the serial port associated with the iLO (integrated lights out) port. These machines are meant to run in a datacenter and maintained by people off-site. Personal Computers since the introduction of the IBM-PC in 1981 employed BIOS firmware to bring hardware up to a known state before booting an OS. as PCs scaled up to replace traditional minicomputers, BIOS implementations were leveraged to meet the challenge. Anyone who has ever worked with x86-based commercial servers are already aware of one of the dangers: removing a drive (or rebooting with a dead drive) will cause all the lettered drives after it to move up one position in the alphabet. This causes a real mess if anything boots by, or is mounted by, drive number. So what's in your Itanium? You could switch it into a graphics-based setup display as seen in the rx2650 photo to the right but certain changes (like enabling/disabling threading) must be done in "legacy mode"
comment: if you didn't know any better you would swear you are looking at a picture of an ProLiant DL380 or DL385. Notice that these drives are slotted vertically. Although my rx2800-i2 does support VGA graphics, USB-keyboard and USB-mouse, the interface contains no graphics and appears to be totally text-based. Furthermore, no provision was made for a booting OpenVMS to communicate with this graphical display. comment: I recently worked on a newer PC (Compaq ProLiant 500) which had a graphics-based UEFI that looked somewhat similar to the picture to the right. Trying to find a functional VT monitor with a DB9 serial port these days is next to impossible so I used my laptop along with a USB-to-DB9 dongle. 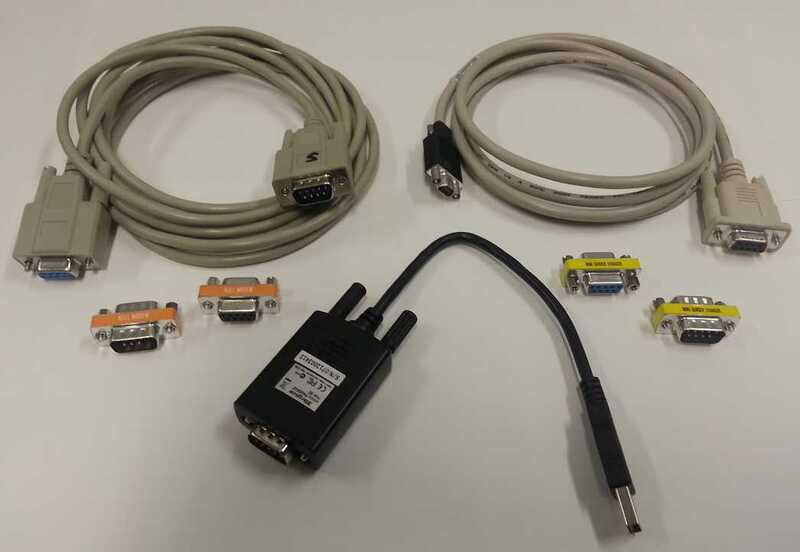 In my case both serial ports were DTE (male) so I needed an F-F null modem cable. TeraTerm worked like a charm. surfing around (via Google) will take you to sites claiming that a VGA monitor could be used to do the initial OS install by first reconfiguring the console via the CONCONFIG command from the UEFI shell. Perhaps those sites were installing HP-UX, or perhaps that method works for other Itaniums but it did not work for me. setting "VGA = primary" and "SERIAL = off"
setting "VGA = primary" and "SERIAL = secondary"
(C) Copyright 1999-2013 Hewlett-Packard Development Company, L.P.
Press Ctrl-C now to bypass loading option ROM UEFI drivers. (C) Copyright 1996-2010 Hewlett-Packard Development Company, L.P. Note, menu interfaces might only display on the primary console device. The primary console can be changed via the 'conconfig' UEFI shell command. Automatic boot entry execution will start in 7 second(s). media present in the DVD drive) you will likely see one or more "blk" entries and zero "fs" entries. Notice how fs0 (red) points to blk0 (red) and vice versa. Also notice the alias names in green and purple. <ur>	bcfg boot add 1 \EFI\VMS\VMS_LOADER.EFI "OpenVMS 8.4"
Question: So what just happened? which you install from DCL via the PRODUCT command. Playing with the VMS-BASIC compiler. I compiled the following demo program on both Alpha and Itanium making sure to get the loop limit from an external prompt in order to foil certain kinds of automatic compiler optimizations. Also, both were compiled with command-line switch "/optim=level=0"
case 1 to 100			! for j% = 1 to i%			! print "this is test line:";j%	! Caveat: these overly simplistic comparisons ignore other important factors like: memory technology, memory size, cache architecture, cache size, disk drive transfer rates, maximum NIC speeds, etc. Real World Update #1 (2015-07-11): compiling a very large (60k lines) BASIC program on this Itanium is 2.1 times faster than our production AlphaServer. Real World Update #2 (2016-02-14): something wonderful happened after we installed the SAS Cache Memory Module (see Day20 below). Compiling the large 60k line program now only requires 35 seconds on this Itanium making it 10.3 times faster than Alpha. Since this is a "single process" observation (because the compiler can only engage one CPU core), having twice as many cores means this platform should be able to do 20.6 times more work at the same time. Perhaps even a bit more if you recall that these CPUs are hyper threaded (OpenVMS sees 8 CPUs). This required a reset/reboot of the iLO (Management Processor) and this was all done with OpenVMS running (very cool). Even though we are now on a different architecture CPU, this command worked without modification. Many of our smaller programs only contain a few external functions found in [.fun] which are compiled every time we rebuild. Some larger programs (which are continually being rebuilt) expect to find the object files associated with precompiled functions inside our custom library ICSIS_FUNCTIONS.OLB (anyone modifying an external function is responsible for updating the library). We have been using a home-brewed DCL script to create/maintain this OLB for the past 15 years starting with VAX then leading to Alpha. On Itanium this script only works once (library creation) but fails when replacing an individual module upon a subsequent pass. (you will get a weird message about your OLB not being an ELF library). the fix: modify the library maintenance script replacing "libr/cre ICSIS_FUNCTIONS.OLB" with "libr/cre/obj ICSIS_FUNCTIONS.OLB"
I have one program which builds with some very strange linker messages on Itanium. This area of the code is a place where I employ sys$cmexec to call a small function which sets/changes a logical name in table LNM$SYSTEM_TABLE (Why do it this way? It is a supervisor-mode logical name which means I must first change over to executive mode; if this stand-alone program used a CLI then I could just use LIB$SET_LOGICAL; in hindsight the CLI-based approach might have been less painful). due to an administrative FUBAR when we ordered this new platform, DEC-C was missed. That license arrived today and I was able to build all of our "C" programs and external functions with no problems whatsoever. Okay so I didn't see this one coming. Today I downloaded a fresh copy of CSWS-2.2-1 from the HP website. Our home page contains some jQuery which is employed to convert a linked-list into a sliding menu (http://www.dynamicdrive.com/dynamicindex1/ddsmoothmenu.htm) but most other pages at our site also make extensive use of jQuery and AJAX so if the home page has problems then so will everything else. We were running CSWS-2.2 on the Alpha and it did not require stream_lf format text files so it looks like we're in a jam for a little while. What to do? Good news. I requested a "CSWS-2.2-1 patch" from from HP today via my OpenVMS support account. HP responded within an hour by placing the patch in a 24-hour drop box. I installed the patch ( a replacement version of APACHE$HTTPD_SHR.EXE ) and now everything works properly. comment: anyone working with VMS or OpenVMS is probably aware of FTP-induced corruption were some files (like .js) might be saved with a record format of "512-fixed" rather than "variable length". Apparently that was what had happened with the previous version of DDSMOOTH on Alpha but we didn't know it. This time I downloaded the files to my PC, zipped them, then FTP'd the zip to OpenVMS. Unzipping text files on OpenVMS almost always saves them as stream_lf which is not a problem for editors and/or Apache. I think it is safe to say that most modern systems push messages between them using SFTP (which is based upon SSH) or SOAP. However, older interfaces connected to other non-OpenVMS systems may require FTP transfers and this can be a problem. Why? both TCPware and MultiNet provide logical names (eg. multinet_ftp_unix_style_by_default is one of many) to adjust the view as seen by connecting clients. This is done on a per-account basis by inserting ftp-specific logical names into the receiving account's LOGIN.COM script. TCPIP Services for OpenVMS does not have anything like this. If this interface were rewritten today we would demand to push uniquely named files of the form "YADA-ccyymmddhhmmss.txt" but would still need to deal with problems like: "full destination disk", "unable to connect", and "receiving end not processing their inbound message files"
As usual, I was interrupted when configuring SSH which led to some delays in getting SFTP to work properly. would have happened with any stack from any vendor which is why I have documented the problem here. shares must always appear listed as one-liners after "sys$input/opt"
Note: it would have been just as legal to insert "sys$input/opt" just above the last line. However, I have seen different warnings about not sending more than 900 characters to this compiler "on one equivalent line" where example-1 already exceeds 600 bytes. The equivalent line length of example-2 is ~200 bytes which ends just after "sys$input/opt"
For the past three years we have support web-based file uploads to our OpenVMS-8.4 Alpha platform. I've got an old Alpha junker sitting in the corner with OpenVMS-8.4 installed. Just out of curiosity, I installed the Alpha version of CSWS-2.2-1 and it worked properly. caveat: other sites offer MPACK/MUNPACK versions 1.6a and 1.6b which do supply Itanium binaries. However, they add new UNIX functionality for all OSs (like not writing out a file if it already exists). This isn't an issue on OpenVMS systems due to the ability of Files-11 to include a file version number. Anyway, if you use 1.6 then you must supply an additional command line switch to disable the new features. you remembered to wear your anti-static strap, right? if you are using the SAS drives for primary storage then install this kit even if you do not need additional storage. The increased performance is worth the price. The cutover was totally uneventful. A 100% success. Well, perhaps only 99%. We missed a few rinky-dink items caused by lapses in our own documentation. This is an area we intend to improve. What a neat platform. Upon first blush this rx2800 appears ten times more powerful than our existing AlphaServer DS20e but at one quarter the cost. I previously remember saying: I didn't think there was any argument (outside of not being in possession of your source code) for not porting "from VAX to Alpha". Now I am forced to say the same thing about porting "from Alpha to Itanium". In fact, I highly recommend it. While I have no doubt that our platform will eventually be migrated again to OpenVMS on x86-64 when VSI finishes their OS port, our 13-year-old Alpha was starting to give us some grief so we just couldn't wait any longer. Like VAX before it, this appears to be the end of DEC Alpha technology in our shop; but OpenVMS still lives here! New drives arrived today so I slotted two of them. After inserting my two I can still only see the DVD from the EFI Shell. You can run "map -r" all day but will not see the new drives until you run the ORCA (Option Rom Configuration for Arrays) Utility to tell the P400 controller that the drives are, or not, part of a RAID set. After that just run "bcfg" (boot configuration). Like the rx2800 above, the real-time-clock will continue to prompt for the date-time at boot until "you install the load an OpenVMS license" -AND- "install OpenVMS-8.4 update 500"
Our group has an active software support agreement with HP/HPE which allowed me to download the HPOFM (HP Offline Firmware Management) utility. This is an ISO image which you burn to a CD-ROM then boot in your Itanium server. This utility advanced my firmware dates from 2008 to 2013 in ~ 7 minutes. Slick! you must also unlock the socket pins before installing a new unit unit then lock the pins afterward. well that's all I'm going to post here. This is slick technology and I wished we could have used it to replace our Alpha Servers 5-years ago. At first blush you might think that the graphics-based setup associated with EFI systems may be of some use to you but you would be wrong. many things can be seen in GUI mode (like whether "CPU threading" is enabled or disabled) but can only be changed from text mode (also called legacy mode). this can be "text mode on a VGA monitor" or "text mode on a character cell terminal over the iLO port"
there is a boot command associated with EFI but the only way to boot this UEFI system is via the bcfg (boot configuration) utility. This got me thinking: what was the best way to monitor firmware-managed drives from the OS? Perhaps I could write a DCL script that invokes the MSA utility. 2) in the MSA utility, physical DISKs begin numbering from "1"
3) in the MSA utility, logical UNITs begin numbering from "0"
In PDLA mode, Unit 1 is Lun 1. No spare drives are designated. Rebuild operation is triggered for Units. Issue SHOW UNIT command to know the status of the Units. reboot the DVD (or OpenVMS system disk) but be sure to enter ORCA (online raid configuration utility) before the media is accessed. $ set def dka0:[sys0.syscommon.sysmgr]			! $ show dev/full dka2:					! -+- do these appear to be similar in size? Comment: contrary to popular belief, the OpenVMS system disk is not partitioned. There is no FAT-32 partition to hold the UEFI/EFI boot files. However, this file "SYS$SYSDEVICE:[VMS$COMMON.SYS$LDR]SYS$EFI.SYS" is a special file which can be found then read/executed by the EFI/UEFI boot loader. It is not safe to use this program to make changes. Adding or modification of Raid Unit failed. I know that RAID unit-0 was built by HP in Singapore because that's the way it was delivered to Canada. I know that RAID unit-1 was built from the ORCA (Option Rom Configuration for Arrays) by me three years ago. So why has HP (now HPE) allowed the firmware to get ahead of program MSA$UTIL ??? Until this Itanium system came along in 2015 I always thought that Hyper Threading might be some sort of marketing scam. But if it is true that OpenVMS breaks up multithreaded-thread CPUs into a set of virtual CPUs which are queued by a thread dispatcher, then I was wrong.